FFA is a dynamic youth organization that changes lives and prepares members for premier leadership, personal growth and career success through agricultural education. FFA develops members’ potential and helps them discover their talent through hands-on experiences, which give members the tools to achieve real-world success. 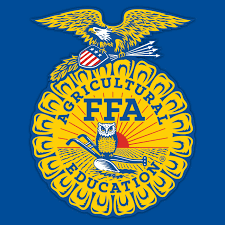 FFA is an extracurricular student organization for those interested in agriculture and leadership. It is one of the three components of agricultural education. In partnership with the Hagerstown FFA chapter, the Animal Science classes at Hagerstown Jr./Sr, High School are raising feeder steers to fill the cafeteria freezers. The FFA chapter harvest corn off of the school crop plot to place on grain bank at our local Harvest Land elevator. Working with Kalmbach feeds in Pershing, students are able to create a ration that allows our cattle to grow and maintain the proper nutritional levels needed. The animal science classes are the workforce behind the operation, feeding, weighing, and checking cattle and maintaining the property on a daily/weekly basis. We feel this project brings our community together and provides our students with great agriculture knowledge knowing where their food comes from.